Visit the emblematic sights and beautiful locations of Madrid's city center and embark on a journey through the history of Spain's capital during a 90-minute tour that will introduce you to the magic of this city. 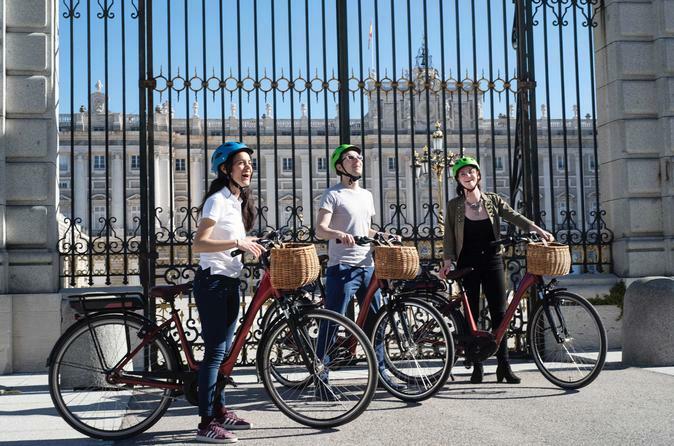 During this 90-minute guided ebike tour, you will visit the city's must-see sights, as well as its most important neighbourhoods and immerse yourself in Madrid's history, culture and lifestyle. The tour will lead you to the beautiful quarters "Barrio de las Letras" and "Madrid de los Austrias", giving you a thorough introduction to Madrid's history and pointing out exciting follow up activities, such as the most interesting museums, restaurants and other attractions to visit. Starting at Plaza de España, you will first visit the Templo de Debod, an Egyptian temple that was brought to Madrid in the 19th century. You will continue to the Plaza de Oriente, the Royal Theater and the Royal Palace, the largest in Western Europe and official residence of the King of Spain, which is located right next to the Cathedral of Almudena. Next, you will visit the famous quarter Madrid de los Austrias and the old city center, Plaza de la Villa with its beautiful 16th century palaces, as well as the Plaza Mayor and the Cava de San Miguel. In the Barrio de las Letras, your guide will take you to the Plaza de Santa Ana with its statues of famous writers like García Lorca, its typical restaurants and picturesque buildings. You will continue to the Metropolis Building, the square Puerta del Sol, the km 0 of all roads in Spain and the Plaza Mayor. The tour then goes to the Gran Vía, its many theaters and to the Plaza de Callao with the Capitol Building. After visiting the Gran Vía boulevard, you will return to the start point, Plaza de España.